Chelsea head coach Antonio Conte believes his team can deliver a huge psychological blow to Liverpool’s Premier League title chances. Conte’s side are eight points clear atop the table and 10 ahead of Liverpool ahead of their trip to Anfield on Tuesday. Jurgen Klopp’s men are winless in three league games, while their poor run of form also includes cup losses to Southampton and Wolves. Conte feels Chelsea have an opportunity to land a significant blow in the title race with another win. “For sure, it would be a hard hit, mentally, for them [if they lost],” the Italian told UK newspapers. “But there are 15 games after this, and 45 points available before the season finishes. For this reason I think the result is important, but the result doesn’t decide the season of Chelsea or Liverpool. Chelsea suffered a 2-1 loss at home to Liverpool earlier in the season, followed by defeat at Arsenal, but then came a 13-match league winning run to put them clear in the title race. 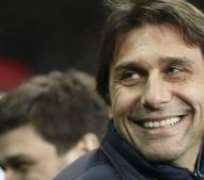 Conte said the defeats helped spark much-needed change at Chelsea, who have won back-to-back league games since their loss to Tottenham in early January. “We grew a lot. If you think about the first game against Liverpool, I said we’d faced a really great team in Liverpool, but that day we weren’t a team. Only through work could we improve to become a team,” he said. “I think it happened because after the games against Liverpool and Arsenal, we improved a lot in our performances and our identity and our confidence. “For this reason, now we are top of the table. It’s incredible, this, because it’s not easy to have two defeats against Liverpool and Arsenal and find the strength to start and arrive on top of the table with 13 wins in a row.